My obsession of LEDs has led me to this. Aurora 9×18 is a thing of beauty (if I can say so myself) – has 162 RGB-LEDs in a circular configuration. The color of each circle is controlled by a microcontroller using a twisted form of PWM. The microcontroller (PIC24F08KA101) only has one PWM module, yet Aurora is capable of 27 (9xR,G,B) independent brightness control. This Instructable reveals the inner-working of Aurora 9×18 through the building process. A RGB LED is nothing more than a LED that actually encases 3 small LEDs of primary colors inside. RGB LEDs can create wide range of colors by combining 3 primary colors – Red, Green, and Blue. By changing the ratio between the 3 colors, you get many in-between colors. RGB LEDs are often called full-color LEDs. Most of brightness controlling circuit utilizes the method called PWM. Many of microcontrollers today have a PWM controller or more built in, however there are usually less than 4 or 5 of them in a controller. So if I were to control 9 LEDs, I needed to use multiple controllers or external circuits. If those 9 LEDs were RGB LEDs, then there would be 27 PWM controllers needed. I’ve gone through a few approaches – multiple microcontrollers working together in various configurations – some are complex and exotic. I was trying to solve more than just the number of LEDs that I can control – I wanted to make the fades in/out of brightness as smooth as possible. Turned out, 8 to 10 bit PWM resolution that most PIC microcontrollers provide was not good enough to create smooth transition in the darker/dimmer part of the brightness change. When the brightness is low, the transitions look more like steps than fading. Due to human eye’s non-linear or exponential response to light intensity necessitates gamma correction of the brightness change curve, which requires at least 12 bits of PWM resolution to give smooth fades (in my conclusion). So I came up with an idea of combining PWM with multiplex drive. I further broke up each PWM cycle into multiple pulses, so that multiple LEDs were lit multiple times within one PWM cycle. (Kind of hybrid between PWM and PDM, I guess.) This way, the average output of LEDs are the sum of the many pulses within the short period. By combining more than one PWM pulses increases effective PWM resolution. This technique also helpes reduce the perceived flicker of the light out of LEDs. Aurora 9×18’s LED refresh rate is about 246 Hz, but LEDs blink a lot more often. This creates the illusion of much higher refresh rate. Take a look at the timing chart. I picked 7 LEDs and R/G/B bus signals to present the concept. As you can see, R/G/B buses go up momentarily, taking turns. These pulses control the actual duration that LEDs light up. Each common lead of the LEDs controls whether that LED will light during the period that R/G/B buses go high. The actual timing that LEDs light up are marked with the color on the chart. LED 1 is on level 1 red (the lowest brightness). LED 2 is on level 2 green. LED 3 is on level 3 blue. LED 4 is on level 3 yellow (red + green). LED 5 is on level 3 purple (red + blue). LED 6 is on level 3 turquoise (green + blue). LED 7 is on level 255 (maximum brightness) white. * time scale is about 8.1 ms for the entire width of the chart. Hope this explains the way Aurora controls the brightness/colors of LEDs. LED refresh rate originally stated was wrong – it’s 246 Hz not 123 Hz. Aurora 9×18 has 18 RGB-LEDs in each of 9 circles, total of 162 LEDs. 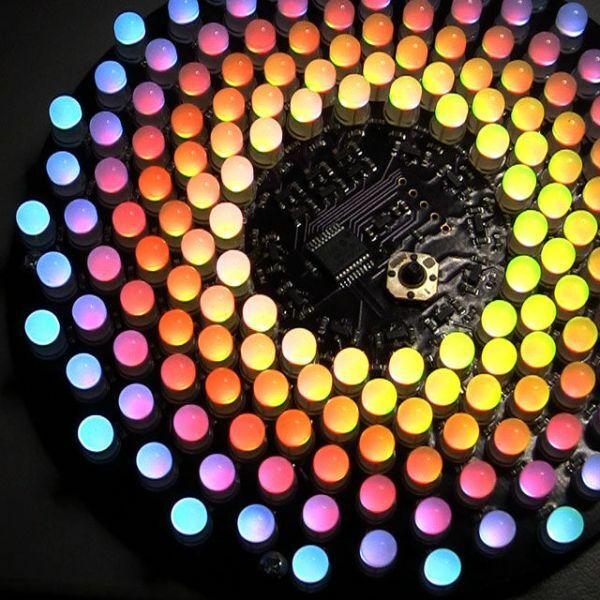 Each circle is LEDs are connected in parallel, so there are 9 LED circuits (x3 because they are RGB) to control. I chose PIC24F08KA101 as the controller. It needed to be powerful enough (16 bit), and requires minimum of external parts (no crystal needed to run at the max speed of 32 MHz) to save space. If you look at this circuit you might realize that it’s just like 9×3 matrix circuit, but instead 3 rows are replaced with 3 primary colors of RGB LEDs. So now you know that RGB channels are multiplexed – in other words those 3 colors turn on one by one, not together at the same time. In general I don’t like multiplexing, but I needed to compromise in favor for the simplicity and physical space. Given that this microcontroller only has one PWM module (to control the brightness of LEDs), I had to come up with a way of extending that PWM signal into 3. I’m doing that with a simple “AND” logic utilizing the lower part of the R/G/B bus driving circuit. In short, R-BUS only turns on when PWM signal is high and R-DRV signal is low. For G-BUS, PWM -> high and G-DRV -> low, and so on. This circuit works remarkably well, saving my precious space on the board and a few dimes. I’m using MOSFET on the high-side switch simply because BJTs that I can find in the small package do not handle the current drawn by 162 LEDs in parallel (about 3 A peak!). This MOSFET (DMP3098L) has a remarkable current handling capability. Highly recommended. Low-side (column, or each LED) driver/switch circuit is very straight forward. NPN BJT in common emitter configuration. There are 1k Ohm resistors connected to the output of each driver, which some of you wonder as to why. Those resistors help the transistors turn off quicker when there are no LEDs conducting (transistors turn off quicker when there is current going through drain or collector). Those transistors are switching at the timing in the order of nanoseconds, so turn on/off speed becomes critical. In a nutshell, those resistors allow PWM to run at a higher speed (less visible flicker). I wanted to make this object as small as possible, so designing the PCB took some work. In reality, I went back & forth between the circuit design and PCB design, trying to reduce part count to the minimum. I had the PCB fabricated by DorkbotPDX. They have a community based PCB program (kind of like BatchPCB) that I like. As you can see, the boards are beautifully manufactured (in the USA :). The solder mask is dark purple.